"Tomato: Fruit or Vegetable?! Discuss amongst yourselves. Meanwhile, prepare these chops with a tomato based sauce and serve them with hot cooked pasta and fresh sliced mushrooms." Season pork chops with garlic salt to taste. In a large skillet, heat oil over medium high heat. Add chops and brown in oil for about 4 to 6 minutes each side. Remove from skillet and set aside. In the same skillet, saute onion and celery until translucent. Add tomato paste and heat through, stirring, until liquid is bubbling. Add tomato sauce and heat through, stirring, until bubbling. Add water to thin sauce. 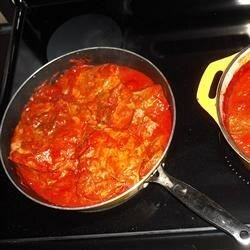 Return chops to skillet, reduce heat to very low and let simmer until meat is very tender and sauce thickens (about 1 1/2 to 2 hours), adding water as needed. My son really loved it. Used the extra sauce the next evening for meatball sandwiches. I wanted some pork as an extra meat option for my spaghetti last weekend and found this to be perfect.